Odessa, Texas–(BWW Wire- Nov. 23, 2008) – Energy Fabrication. (“the Company” or “Enerfab”) is pleased to announce that the Company’s new website can now be accessed by customers, employees and interested parties at www.energyfabrication.com. Monteray, California –BWW Wire – Dec. 12, 2008) – At the 52 Annual AESC Summer Meeting in Monteray California, Tommy Southall, CEO of Energy Fabrication Inc. spoke on the history and improvements in safety as well as the latest innovations with regards to Hot Oil Units. Odessa, TX – –(BWW Wire — Oct 21, 2008) Energy Fabrication, mounted an outstanding display at the Permian Basin International Oil Show in Odessa that attracts buyers from around the globe. 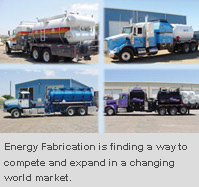 Odessa, TX – –(BWW Wire — Oct 25, 2008) Energy Fabrication, manufacturer of hot oil units and other oilfield equipment for foreign and domestic producers is pleased to announce the availability of custom designed super-heaters.